Since the 1970's I have been a pen afficionado. Although my initial collecting has been by sets, my main passion is with fountain pens and those are the pens I find that I buy the most often. My pen collection includes many brands of pens, however, I always find myself drawn to my Waterman pens. It's the way the Waterman nib glides across the paper. There is the balanced weight and size of the pen body. The secure fit of the cap to the barrel. All these give an overall feeling of quality. That's what keeps me going back to my Waterman pens. So when planning a previous trip to France I arranged a visit of the Waterman factory in Saint Herblain which is located just outside of the city of Nantes. I was lucky, as although Waterman does not give tours to individuals, an exception was made. I was able to visit the factory. When I was walking about the factory, and seeing the various phases of the manufacturing process I immediately gained an appreciation for the amount of work that goes into making a quality fountain pen. I met Waterman employees who showed me how they manufacture and assemble the pens. The quality I have recognized in Waterman pens is a direct reflection of the concern for quality shown by the Waterman employees. Patrick Hulot, of the Quality Department, hosted my visit. He explained the various phases of the manufacturing and assembly process. We started the discussion and tour in the stamping section. Here large bands of brass are automatically fed into machines that stamp out small circles. The circles of brass are then shaped into the pen parts by compressing the metal into various moulds. The process which compresses the brass gives the metal its strength. The stamping machines are set to produce each specific pen part. Although the process is very automated, employees check for quality throughout the process. The final barrels and caps are placed in wire baskets which are labelled as to pen line and part. The parts are then cleaned. This is an automatic process which immerses the parts in a bath to remove the oils used in the stamping process. The cleaned parts next go for cutting. Here the stamped-out barrels and caps are cut to the exact measurements of each particular pen. While much of the cutting is done automatically by machine some pieces are cut by hand-operated machines. Even for the cutting done by machines, employees must set the programme for the specifics of each individual pen part. All the manufacturing stages involve quality checks. Waterman employees are trained in a self-monitoring quality control checking process. This way, quality is not something that someone else does, it is the responsibility of each individual employee. The employees I met demonstrated pride in their work and their concern for the quality of the finished product. From the cutting section the metal pen pieces next go to be polished. The barrels and caps are placed on spindles and pass under circular polishing brushes. All metal parts are polished and then cleaned again to remove oils used in the polishing process. At this point, Patrick explained we were at a crossroad. The top-line pens are produced in a segment of the factory that involves a considerable amount of hand work. The other pen lines go to a section of the factory where the process is more automated. I was especially interested in the manufacturing of the Man and Patrician series--some of my favourite Waterman pens, so I am only writing about the process for the top-line pens. With the final cutting completed, the top-line pens require gold plating of various parts. Here, racks of pen parts are immersed in plating baths. Employees programme the machines that immerse the pen parts in the baths so that each part receives the right amount of gold plate. The making of the nibs for the top-line fountain pens is a very manual process. Bands of gold pass through a machine that make an initial cut into the rough shape of the nib. These pieces are fed into a presser that compresses the metal. This process increases the strength of the metal, gives the nib a tapered thickness and develops the "spring" of the nib. The nib piece then receive a final cut appropriate for the specific pen model. At this point, engraving is added to the nib. The tip is then coated with a mixture of hard metals and the ball is manually welded to the nib. The nib is then cut to create the forks. There is a final moulding and calibration of the tension of the forks. I have always been impressed with the smoothness of my Waterman nibs. I now know why! Employees test each nib for smoothness by trying the nib on a sheet of paper. Once the nibs pass this test they go through a final polishing process. The nibs and pens are assembled and then tested with ink for proper flow. 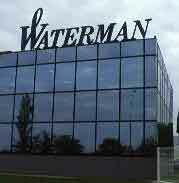 Waterman produces all the parts for their pens. The plant has an extensive moulding section that produces the various non-metal pen parts for all lines of pens. They even mould their own ink cartridge bodies. In addition to the pens, Waterman produces their own ink at the factory and makes all the colours by adding colours to a base ink. At the end of the tour I have an even higher appreciation for my Waterman pens. I never realized how many people worked so hard to produce the pens that I cherish! I thank my hosts--Patrick Hulot, Quality Department; and Christiane Pinguaud, Secretary to the Factory Manager for their assistance with the visit. I now look back at this article and think how much the pen lanscape has changed from the year that I toured the Waterman factory. Waterman had gone through a number of owners. With each new owner, the company has revised its relative marketing plan. For a number of years, the number of upper end Waterman pens that were issued dimmissed. My Man 100 pens still today, some 13 years later remain good looking pens that write great. My Edsons, I have bought the red, blue and green as there just is not a better made pen. Period. It will be interesting to see the relative market line that Waterman takes.